It’s not often that a runner is suffering before the race even begins. But, such was the case for Susan Mulheron before the start of the annual Grandma’s Marathon in Duluth June 20. The race was scheduled to start at 7:45 a.m., and Mulheron, the chancellor for canonical affairs for the Archdiocese of St. Paul and Minneapolis, arrived about an hour early. She was joined by two priests who also ran the race, Father Erik Lundgren of Sts. Anne and Joachim in Shakopee and Father Nate LaLiberte of St. Michael in St. Michael who becomes pastor of St. Maximilian Kolbe in Delano July 1. 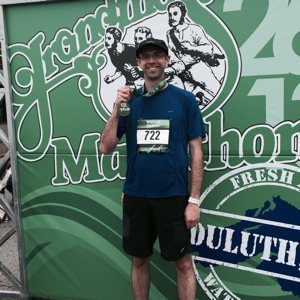 But, Mulheron and the two priests steeled themselves against the elements and successfully completed the 26.2-mile race from Two Harbors to Duluth on Highway 61. Father LaLiberte had the best time, finishing in 3 hours, 38 minutes. Lundgren was next at 4:16, and Mulheron had a time of 4:58. “My time last year was better,” Mulheron said. “And, I was on track to beat that time, but I had to slow down. That’s OK. The most important thing is to start the race and finish the race. But, the race was about a lot more than physical fitness. It was a chance to divert their attention from the big changes that have been happening in the archdiocese, including the resignations of both Archbishop John Nienstedt and Bishop Lee Piché less than a week before the race. That’s precisely why Mulheron, who ran Grandma’s last year, was determined to push through the weather and complete this year’s race. Running has become an important part of her life, something that helps her deal with being at the center of all the struggles the archdiocese is going through. 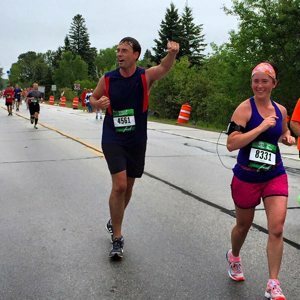 “I signed up [for Grandma’s Marathon] because I realized that running had become a very spiritual thing for me,” she said. “It had become essential, not just for my physical wellness but for my emotional, my mental and my spiritual wellness. 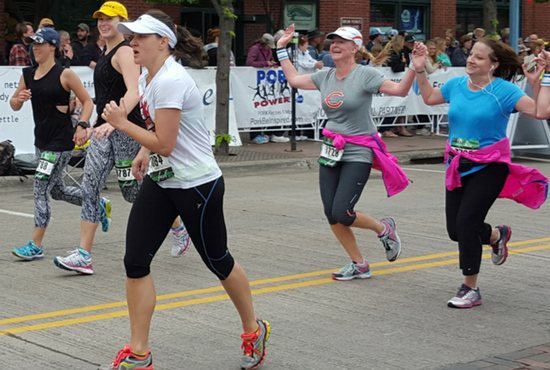 Mulheron already has signed up to run the Twin Cities Marathon in October, and hopes to pull others along with her. She would like to form an archdiocesan team, with people like Fathers Lundgren and LaLiberte as her prized recruits. Father Lundgren is open to the idea, but he has even bigger plans. They involve what some consider the ultimate physical challenge — and a large chunk of money. What’s more, he would like to raise $33 million for archdiocesan Catholic schools in the process. He turns 33 in October and wants to do the Ironman while he is 33. 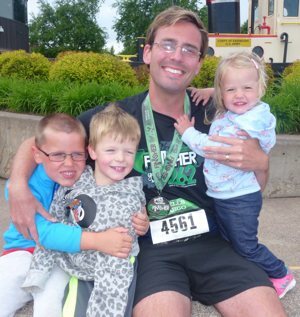 He once raised $50,000 for Divine Mercy Catholic School in Faribault when he ran the Twin Cities Marathon in 2012. So, he’s ready for an even bigger fundraiser.